we have well trained staff and specialized tools to handle your watch. Service Centre Nugegoda has specialized tool and staff for luxury watches and undertake selected brands of watches for repair and service. For customer convenience, Crescat showroom now has the repair-handover facility as well. we have well trained staff and specialized tools to handle your watch. As an Authorized service centre, we have access to original parts, training and assistance from our brands..
Service Centre is equipped to handle any brand of watch or timepiece for repair or service. All service centres have access to the latest watch servicing machines and tools and use genuine parts and comes with a warranty. For minor battery, strap and other minor onsite repair services are offered by the service centres and the Havelock Road location. Other retail locations do not undertake any repairs to ensure the safe handling of your watch. Bezel is the upper portion of the watch that surrounds the face. Bezels come plain or with crystals / diamonds or with a rotating ability. Watch repairs relating to the bezel can often involve a complete new watch case as manufacturers treat them as one assembled unit. The bracelet or 'watch band' of a wristwatch comes in different styles and materials. Generally it's Stainless steel but higher end watches uses Stainless steel, solid gold and other high tech material like ceramics. The bracelet can be sized to fit the wearer. It is rarely possible to repair watch links, unless they are real silver or gold but additional original straps, links of any material can be ordered through our brand principles. The crown, sometimes referred to as the 'winder' or 'button' is used to set the time and date on your watch. If damaged the crown can become hard to use and may cause damage to other parts of the watch. Many crowns, particularly on watches over 100m water resistant, have rubber gaskets that protect the inner workings of the watch from water ingress. So we recommend testing the watch for water resistancy every year or avoid swimming daily with watches under 100m. Dial is the 'face' of the watch. The dial shows the time and often day, date and stopwatch functions. It is very difficult to re-finish watch dials. This is usually only undertaken on more expensive watches or those with sentimental value. It is always easier to replace the dial unless the parts are no longer available from the brand. Glass - The glass, or 'crystal' is the transparent front of the watch that protects the hands from dust, dirt and damage. Materials that are used include mineral crystal, sapphire crystal and resin. Sapphire crystal comes in high end brands and is scratch resistant. Watch glass repairs usually involve fitting a new one. Sometimes, if the "glass" is resin, small cuts and scuffs can be polished out successfully. Replacement glass is available if polishing is unsuccessful in getting the scratch out. When it comes to broken crystals, the watch has had to sustain a shock for the crystal to break. For this reason, it is imperative we first review the inside of the your timepiece as well. Movements/machine are powered by many sources, a battery/cell, winding and self-winding/automatic watches. We are able to replace batteries in most watch brands, replace watches and replace parts as needed. Regular servicing is recommended on all watches, especially the high-end winding and self winding movements in order for them to work for generations to come. Generally it is every few years but please refer to brand recommendations. A product may be classified as �Water Resistant� if it is sufficiently impervious to water or moisture when it is immersed completely in water for five minutes under atmospheric pressure of 15 pounds per square inch and for at least another five minutes under an additional pressure of at least 35 pounds per square inch without the entrance of moisture. 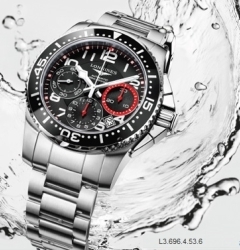 If your watch is water-resistant it is essential that the seals be checked each year before the swimming season because, without your realizing it, they might have been damaged as the result of a shock. All water-resistant models should have the gaskets changed every 18 months to two years. If the watch is used in daily showering, a chlorinated pool or salt water, the gaskets should be changed on a yearly basis. If Moisture enters the watch due to a breach in the case, such as a gasket that has failed. As a result, the clouding of the crystal remains constantly or occurs every time the watch is worn on the wrist. In such a case, the watch should be taken to a qualified watch repair person as soon as possible to minimize moisture damage. If you have a quartz watch the electrical power is supplied by a battery. After 12 to 18 months of use (with the exception of watches with lithium batteries) the voltage in the battery may drop suddenly and cause your watch to stop. Some models have a battery end of- life function. The seconds hand will start to jump every 4 seconds. If this happens we recommend that you replace the battery immediately, because once the battery runs down totally it may damage your watch.A worn-out battery should be replaced immediately in order to reduce the risk of leakage and consequent damage to the movement. You should always push the crown after adjusting the time to ensure a water-resistant seal with the case. Your Eco-Drive needs light to operate correctly. While most types of light will charge your watch, it can take extended periods of time with "normal" lighting. In these circumstances, we recommend charging by exposing your watch to direct sunlight. Sunlight through a window is acceptable but do be aware the glass in your window will refract and minimize light energy coming through so additional charging time may be needed. After fully charging your watch, be sure to do the all reset/0-positioning(some models) and set your watch, otherwise it may continue to operate in an unusual manner. Make sure your watch is water proof by getting it checked by an authorized service centre every year to avoid any water damage. Leather and other straps needs to be cleaned often with gentle damp cloth with soap regularly, to avoid sweat build up. Use a specialized service centre such as our services for regular service and repair. Using a reputable authorized company will ensure that your repair will be done with care and use original parts for your repair. Scratch-resistant means �capable of withstanding scratching that occurs with normal everyday use�. Sapphire crystal, which has a very high level of scratch-resistance. However, there is a risk of scratching if it comes into contact with materials that are as hard as or harder than sapphire. Particles of these materials can be found in nail files, in granite or in sand. We recommend that you take care of your watch and try to avoid wearing it in situations where it may come into contact with other extremely hard materials. Scratch-resistant means �capable of withstanding scratching that occurs with normal everyday use�. Rado high-tech ceramic has a very high level of scratch-resistance. However, there is a risk of scratching if it comes into contact with materials that are as hard as or harder than high-tech ceramic. Particles of these materials can be found in nail files, in granite or in sand. We recommend that you take care of your watch and try to avoid wearing it in situations where it may come into contact with other extremely hard materials. The extreme hardness of Rado high-tech materials guarantees durability and brilliance. The Vickers scale is used to indicate hardness: the higher the value, the greater the resistance to scratches. Rado scratch-resistant materials commence at Vickers 1,200 � far higher than gold, steel or platinum. The top value of 10,000 is attributed only to natural diamonds and to the Rado high-tech diamond surface. Rado watches are hard but not indestructible. Although our high-tech materials are resistant to scratches, Rado watches must be treated with care. They should not be dropped, and sharp knocks should be avoided. If hit hard enough, the materials may break.